NOW YOU CAN OWN THE OLDEST ANTIQUITY IN YOUR NEIGHBORHOOD! OLDER THAN ANY DINOSAUR FOSSILS! (Pictures below are at approximately actual size). 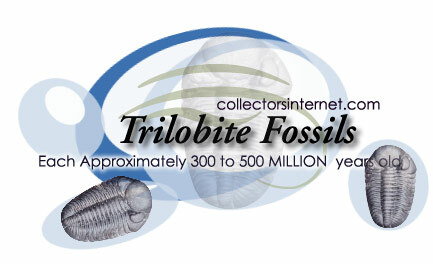 Among famous groups of extinct organisms, trilobites probably rank second only to the dinosaurs in fame. Their fossils are instantly recognizable and often strikingly beautiful. In fact, prehistoric people liked them as much as we do. At Arcy-sur-Cure in France, a 15,000-year- old human settlement, one of the artifacts found by archeologists was a trilobite that had been drilled to be worn as an amulet. Although the last few trilobites went extinct about 245 million years ago, they are one of the best-known and most-studied groups of fossils. The ones that we offer here are guaranteed genuine and are of museum quality, pristine extremely fine or better. These are in such extraordinarily exceptional condition that you can even see their eyes in many cases! Regular retail $69.95 to $349 each.